[Spencer Perceval, the only British Prime Minister to be assassinated.] Autograph Rough Notes, titled 'Parliamentary | Miscellaneous', for a House of Commons debate on Customs and Excise duties, with reference to 'the Brandy act of last year'. On both sides of a 37 x 24 cm piece of paper (i.e. half a 'pinched post' folio leaf), with 1806 fleur-de-lys watermark. Folded twice, to make eight 24 x 9 cm panels (four on each side), in seven of which Perceval has written his notes in a close and neat hand. The eighth panel forms the outside of the folded paper, and on this Perceval has written 'Parliamentary | Miscellaneous'. In fair condition, lightly aged and worn. [The Royal Aid in Bristol, 1666.] Two Manuscript Assessments of 'three moneths Royall Aide mony' (land and goods) for 58 individuals, each signed by four mayors of Bristol: John Willougby, Walter Sandby, Sir John Knight and John Lawford. Ainsworth's 'Thesaurus' (1752) neatly defines 'The Royal Aid, or subsidy money' as 'tributum quod regi ex plebiscito in sumptus belli, &c. praestatur'. It was a one-off household tax, set by assessors and collected locally. (For further information see M. J. Braddick's 2013 paper 'Resistance to the Royal Aid and Further Supply in Chester, 1664–1672'.) The present two documents are each laid out in identical fashion, the two carrying different assessments for 'Land' and 'Goods' for the same 58 individuals. [Richard Brinsley Sheridant of Frome Court, Dorset, Liberal MP and grandson of the playwright.] Extensive tax return ('Succession Duty in Real Property'), signed by 'R. B. Sheridan', detailing tenants and tax on the extensive Frampton Court estate. Frampton Court, Dorset. 17 September 1885. Richard Brinsley Sheridan (1811-1888) of Frampton Court was the eldest son of Thomas Sheridan (1775-1817) and his wife the novelist Caroline Henrietta Sheridan (1779-1851, born Caroline Henrietta Callander of Craigforth). He was the grandson of his namesake the celebrated playwright Richard Brinsley Sheridan. He was Liberal Member of Parliament for Shaftesbury, 1845-1852; and for Dorchester, 1852-1868. He also served as High Sheriff and Deputy Lieutenant of Dorset. He married Marcia Maria Grant (1815-1884) in 1835, and they had three daughters and six sons. [ Edme Sainson, Ecuyer Conseiller Secrétaire du Roi (Louis XV). ] Signed Autograph Document on vellum, giving certified transcriptions of two documents relating to payments by 'Mre. Charles Dorel [...] Banquier Expeditionnaire en Court de Rome'. The two transcribed documents are dated 2 May 1736 and 10 May 1736. The transcription is undated. On one side of a 22 x 33 cm piece of vellum. In fair condition, lightly aged and worn, with some pin-holes to margin. Stamp in black ink at head of the 'REV. CAS DU ROY [...] GEN. DE PARIS'. Signed at end: 'Collationné aux originaux par moi Ecer. Coner. Secretaire du Roy maison Couronne de france et de Ses finances/. | Sainson'. Each transcript is eight lines long, the first having been signed by 'Orry' and the second by 'Carreler' (both signatures also transcriptions). The recorded payments were made by Dorel in connection with his office as 'Coner. Paris: Chez P. Dufart, Libraire, Rue des Saints-Peres, No.1, 1839. x.135pp., light green paper wraps, chipped and stained, hinges sl. loose,top right corner sl. curled, last gathering just holding, edges uncut, text mainly good. No copy listed on COPAC. WorldCat lists only the eBook (apparently), but Googlebooks uses a copy at the Univeristy of Michigan. Signatures on fragment of a document "Nugent / J Grenville / North". Fragment of document, c.1.5" x 4", irregular shape, also containing words ". . . thereof 15 Jany / 21 March 1760 and, on the reverse "Witnes[seth]". North at this time a Treasury official, was to become the Prime Minister whose policies led to the American Revolution. [J. Pownall, A. Munro, R. Frewin and Thomas Boone of the Custom House.] Contemporary manuscript copy of letter regarding the 'Incompetency, either from Ignorance or Inexperience of some of the Collectors and Comptrollers in the Out Ports'. Headed 'No: 337 Custom Ho: London | 29th: December 1787'. 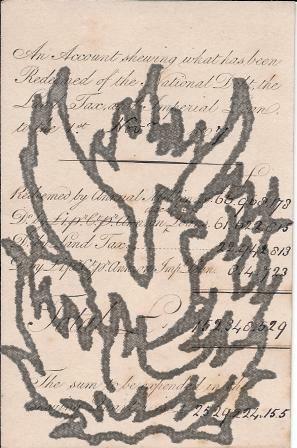 Neatly written out in a contemporary hand on the verso of a foolscap 8vo leaf of laid paper, with 'T TAYLOR' watermark, torn from the letter book of a financial institution. In very good condition, lightly-aged. The names of the four signatories to the original document are given at the foot. The recto of the leaf carries the transcription, in the same hand, of a letter by 'W: Stiles | Secry', with a list of twelve 'Writs dated 6th: Decr: 1787'. [Alexander Davidson, Messenger at Arms.] Signed 'Copy for Mr. Falconer' of a summons on behalf of Archibald Colquhoun and George Buchan to six 'Procurators in the Sheriff and Baillie Courts of Glasgow, regarding the payment of stamp duties. 4pp., foolscap 8vo. Bifolium. The document consists of a long printed text, with blank sections completed in manuscript. It is docketted 'M.5 | Copy for Mr. Falconer | to appear 19/26 June 1810.' In good condition, on lightly aged and worn paper. 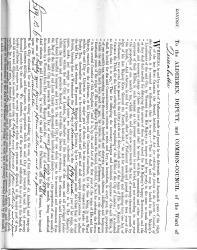 Signed 'Alex Davidson' and dated 28 May 1810, before the witnesses 'John Anderson and John Robertson both Indwellers in Glasgow'. The document begins: 'GEORGE, &c.
Autograph Note Signed from John Blackburne of Orford Hall, Warrington, threatening John Percival with legal action if he does not hand over 'ye money you collected from my tenants in Risley'. With (Percival's?) itemised account of the money. Blackburne's note dated from Orford, 28 May 1746. Later anonymous note to him dated 19 August 1756. 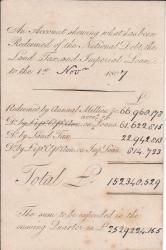 Blackburne's note is 1p., landscape 12mo. The leaf on which it is written has a central vertical fold, with the reverse carrying the itemised account to the left, and the anonymous note to Blackburne to the right. On aged and damp-stained paper. Blackburne's note is blunt and to the point: 'Orford May 28. 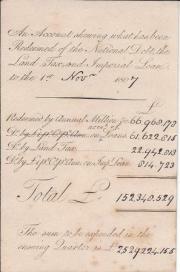 1746 | John Percival | I expect that you pay me in a weeks time ye Money you collected from my tenants in Risley on acct. of the Militia or I shall order Mr Lancaster to sue you for it, without further notice | from | Your friend | J: Blackburne'. Card, c.11 x 7cm, [RECTO] date "Ist Novr 1807" in manuscript as are the figures in acolumn after categorisation as follows: "Redeemed by Annual Million &c [£] 66.968.173 | Do. [corrected in ms. to] on acct of Loans 61.622.815 | Do. by Land Tax 22.942.813 | Do. by £1. pr. Ct. pr. Ann . on Imp. Loan 814.723 | Total £ 152.340.529 | The sum to be expended in the ensuing Quarter is £2.529.224.155. [VERSO] [Manuscript] The Rt Honble Lord Melville". It appears that Melville and, presumably, others, received monthly notice of the size of the National Debt and other figures. 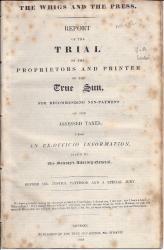 London: Published at the True Sun Office, 366, Strand, 1834. [title continued] ...For Recommending Non-payment of theAssessed Taxes; upon an Ex-officio Information, filed by His Majesty's Attorney-General. Before M.Justice Patteson and a Special Jury. 14pp., 8vo, disbound, foxed, final leaf detached, better than poor and worse than fair. 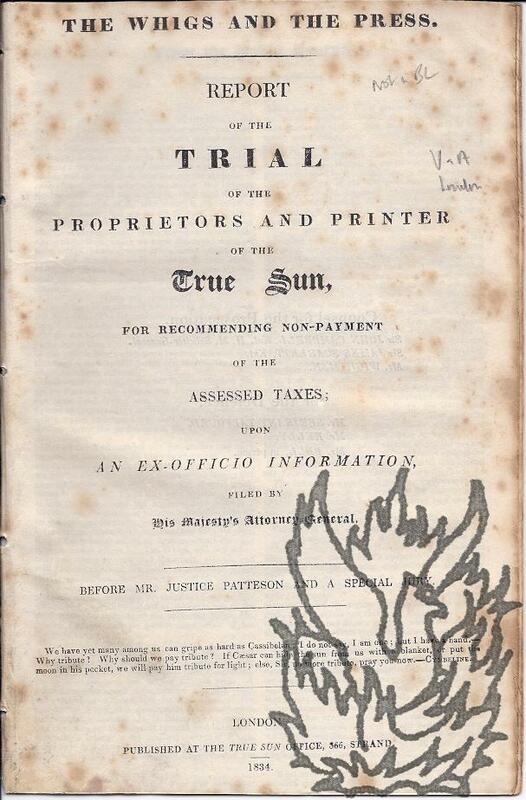 Note: Charles Dickens wrote Parliamentary Reports for the True Sun in his early days. Scarce. COPAC lists copies at the V & A and London, WordCat lists five US copies and one European. Substantial collection of articles (mainly to the 'Glasgow Argus' and 'Wigtownshire Free Press') and other writing by William Durrant Cooper (1812-1875), antiquary, mainly political and much of it anonymous, collected by Durrant himself. 4to, 194 pp. (paginated by Cooper). In original calf half-binding, with marbled boards and endpapers. All texts clear and complete. On aged paper chipped at extremities, and coming away from binding, which has been covered in plastic. With Durrant's armorial bookplate, and signed 'Wm Durrant Cooper' on first page. Printed authority completed in manuscript, 'To the Aldermen, Deputy, and Common-Council of the Ward of Queenhithe', signed by the City of London Commission of Lieutenancy, authorising the collection of a tax to pay the expenses of the City militia. On the recto of the first leaf of a folio bifolium (leaf dimensions 42.5 x 27.5 cm). On grey watermarked laid paper. Good, with slight offsetting from the ten red wafers placed beside the signatures. Headed 'LONDON. To the ALDERMEN, DEPUTY, and COMMON-COUNCIL of the Ward of [Queenhithe]'. Fifty-two lines of text, with manuscript additions, including the name of the ward ('Queenhithe') and the sum assessed (£89 15s 6d). At the foot of the page are large, bold signatures of the ten members of the Commission of Lieutenancy, including that of the Lord Mayor, Stuart Knill. Document (part printed part manuscript) signed "H Fox"; printed heading "Annuity for Life, 1746". Statesman (see DNB). One page, chipped, small tear, trimmed but text clear and complete. The document, part printed (a form), records that Henry Fox on the 23 Aug.
Manuscript, one page, folio, chipped and other minor defects, text clear and complete. "That on the Eight day of April on ye Seenth . . . . . .